The Charlestown Coalition oversees a number of programs and initiatives focused on enhancing youth protective factors*, supporting individuals through drug and alcohol recovery, and promoting healthy families by addressing the mental health and basic health needs of everyone in our community. Our goal is to achieve positive, measurable results not only for the individuals living in our neighborhood, but for the Charlestown community as a whole. First and foremost, we focus on prevention of the most significant challenge to the health of our community—substance use. 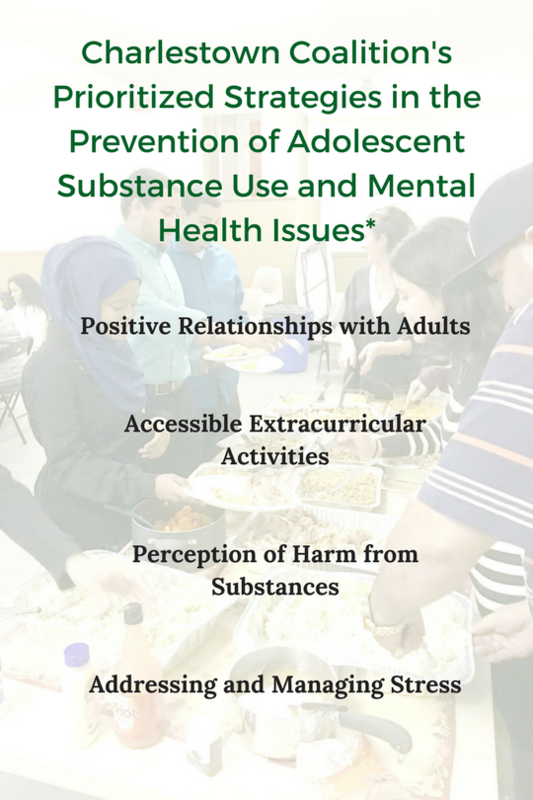 Strategies include providing after school activities for youth, positive role modeling and mentoring, and engaging our young people in social marketing campaigns targeted at the harm of substance use. Our Turn it Around youth program is a prime example of this type of approach. We also provide regular programming and hold educational events and trainings throughout the year on issues impacting our residents. One example would be our monthly Trauma Response Group where we work in partnership with clinicians from the MGH Charlestown Community Health Center. We provide direct outreach to people struggling with addiction; support for those who have lost a loved one to substance use; and, we partner with community agencies like the Boston Municipal Court in specialized drug treatment models to assist people suffering from chronic substance use disorders. In order to promote healthy families, we provide short term counseling and case management; referral to community resources; and, we work with health care providers to improve care coordination by taking a more holistic approach to family support and care. Learn more about our Family Support Circle.